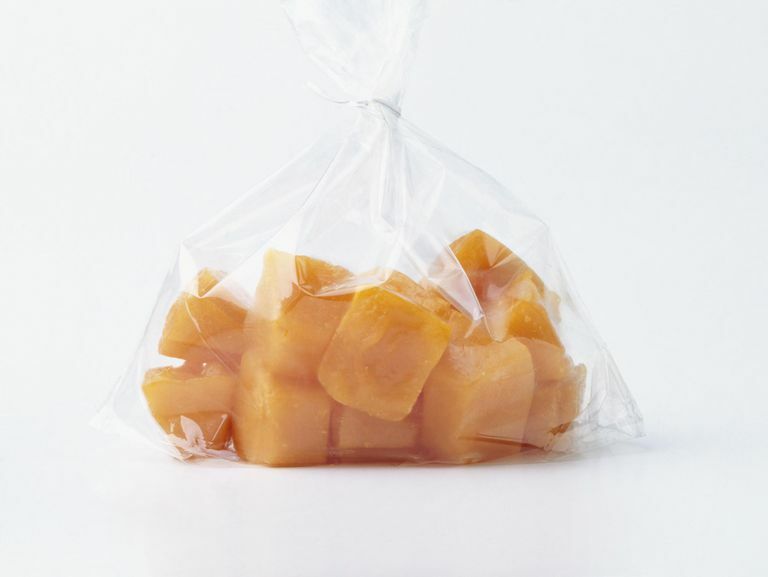 Freezing baby food into cubes is a popular method of storing it into portion-sized amounts. When it comes time to thaw the baby food cubes, you have a few choices of safe methods of preparation. Be sure to use a microwave-safe container. Place a lid or plastic wrap over the container to trap moisture and improve how evenly the baby food heats. If your microwave does not rotate the dish, be sure to turn it halfway through the heating process. Always test the food for the proper temperature before feeding it to your baby. A rather simple method of thawing baby food is to move it all servings for the next day's meals from the freezer to the refrigerator. Be sure that the portions are in a covered container rather than an open one. This will help prevent bacterial contamination. You have two ways of thawing baby food using warm water as the heating element. One is to place the container of baby food inside a larger container of hot water. One cube generally thaws within 10-20 minutes of being submerged. Additionally, you can place the container into a pot of hot water that you have on low heat on the stove. This generally thaws the food more quickly than just hot tap water. Like store-bought baby food, you can store thawed baby food in the refrigerator for 72 hours. Be sure it is in a sealed container to prevent contamination.